Rembrandt, DaVinci and Van Gogh are just a few of the artists that have used walnut ink in their drawings! Unfortunately, their inks were made with real walnuts, which are highly acidic, causing their incredible drawings to fade and the paper to deteriorate over the centuries. Tom Norton Walnut Drawing Ink® is made with artist grade pigments, not walnuts, and it is both lightfast and acid free! You will experience the rich walnut color and superior rendering capabilities loved by the world’s most famous artists knowing that you are using an archival ink. 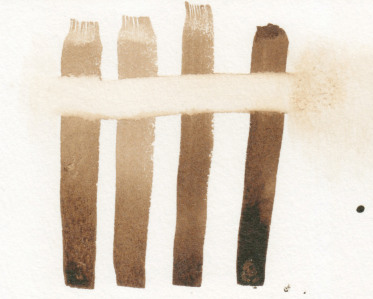 In addition, most brown inks are shellac or acrylic based, which is fine for a myriad of techniques, however they dry permanent. Our ink acts more like a watercolor because it always remains water-soluble. Look Who’s Using Walnut Drawing Ink! Watercolorists love its layering and lifting properties. With Tom Norton Walnut Drawing Ink®, you can layer to darken your tones or add water to lighten them, and you can also use a wet brush to lift color. Calligraphers use it with both dip and fountain pens and really like that it remains water-soluble even when dried so it easily washes out of their nibs. Encaustic artists use Walnut Drawing Ink for under painting on wood substrates because it is water soluble and soaks into the surface without sealing the wood. Since the wood is not sealed it allows their wax paints to be absorbed into the wood and provide a good archival bond with the wood. Encaustic printmakers use it for the same reason so they can create unique drawings on their printing papers before making their encaustic prints. Pastelists use our ink for underpainting on sanded paper since it will not affect the paper’s texture. And, finally, artists in all media love to draw with it for its beautiful sepia tonal qualities. Tom Norton Walnut Darkening Medium® is not only an ink but can also be used an additive to darken our original walnut drawing ink when a drawing needs that extra “punch”. Some artists will add black India ink to darken the color of our original Walnut Drawing Ink. This will work but you will sacrifice the unique watercolor characteristics of the ink and lose the ability to lift color or lighten areas. Adding black India ink also loses the tonality of the beautiful warm walnut color. Walnut Darkening Medium® is very heavily pigmented and made with the same binder as the original so it can be mixed with Tom Norton Drawing Ink® without changing its working properties. It can also be used straight from the bottle for a very intense dark brown. Most artists work with it side by side with the original, dipping and double dipping between bottles for a range of light and dark browns. Most people, when they begin to draw, have a preconceived idea of what a drawing should look like, and this idea includes the kind of marks made by their drawing tool. Consequently, the look they are trying to achieve interferes with their ability to learn the basics of drawing. For this reason, instructors will often substitute twigs for drawing tools since twigs won't make a mark that is familiar or predictable to the student. This frees the student to start recognizing basic drawing elements such as the negative spaces between the marks made on a page and composition possibilities. The Walnut Drawing Stick is a handy tool that, on one end, is sort of like a pen- but not really; and, on the other felted end, is sort of like a brush - but not really. The Walnut Drawing Stick is unfamiliar enough to achieve the same experience of the twig, yet, at the same time provide the capability of achieving, with experience, similar marks made with a conventional pen and brush. 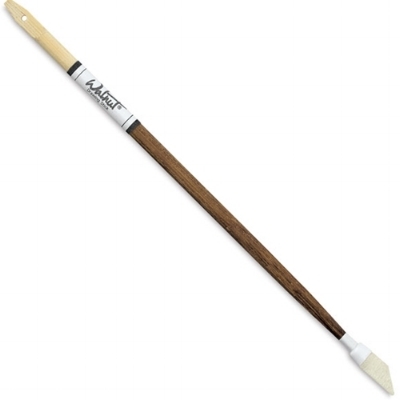 The Walnut Drawing Stick measures 9 inches (23 cm) from tip to tip. Is Tom Norton Walnut Drawing Ink Made From Real Walnuts? No, our ink is not made from walnuts. Our ink is walnut colored made from premium light fast pigments that will not fade over time. Our ink is also acid free. Genuine walnut ink is highly acidic and actually eats the paper over time. The drawings of the Great Masters were made with genuine walnut ink which was black when it was freshly made over time it faded to the beautiful sepia tones that they are now. 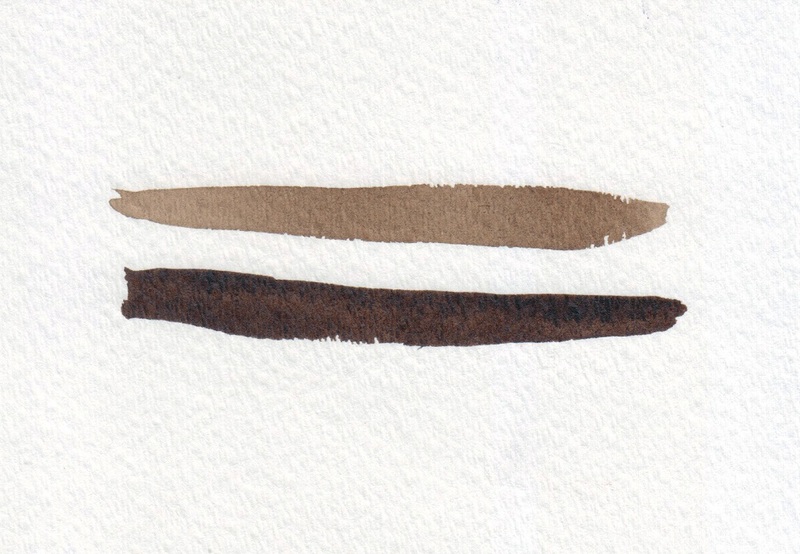 Our Walnut colored ink replicates these sepia tones. Our ink is water-based allowing you to achieve darker tones with layering techniques or lifting to lighten.